TSPSC PGT Physical Science, Social Studies Posts Certificates Verification Date, Selection List Results 2017. 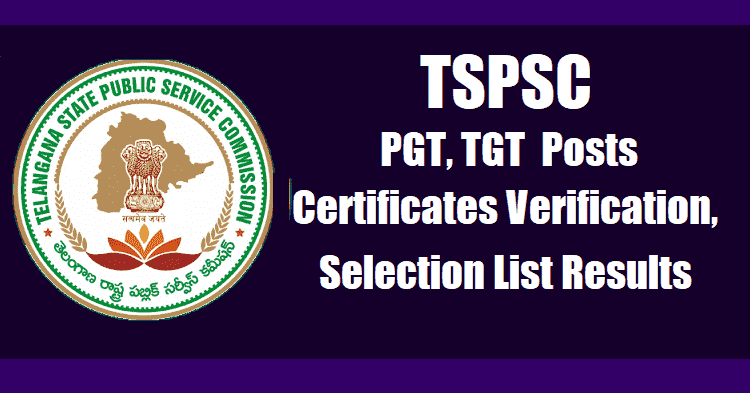 TSPSC PGT Physical Science, Social Studies Posts Certificates Verification Date, Selection List Results 2017: TSPSC PGTs Physical Science, Social Studies Science Posts Povisional Selection List Results, PGT Physical Science, Social Studies Posts Selection List Results, PGT Physical Science, Social Studies Posts Certificates Verification, List of Original Certificates should be produced at the time of verification process. Post Graduate Teachers (Physical Science, Social Studies) in various Residential Educational Institutions Societies.// TSPSC PGT Maths, Biological Science Posts Certificates Verification Date, Selection List Results 2017. TSPSC PGT Mathematics & Biological Science Posts Certificates Verification Date, Selection List Results 2017: TSPSC PGTs Mathematics & Biological Science Posts Povisional Selection List Results, PGT Mathematics & Biological Science Posts Selection List Results, PGT Mathematics & Biological Science Posts Certificates Verification, List of Original Certificates should be produced at the time of verification process. Post Graduate Teachers (Mathematics & Biological Science) in various Residential Educational Institutions Societies.